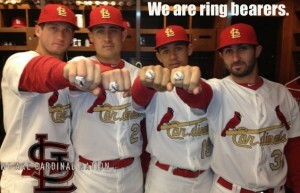 Indeed, as the marketing campaign for the Cardinals says, “We Are Cardinal Nation”. At least that’s what I’ve been hearing. Seems a bit pompous at times, but I suppose winning the World Series of American Baseball entitles the victor to a short bombastic honeymoon. If you only see the officially released campaign material, you might think that Cardinal fans focus entirely on rings, championships, beating the Cubs, and success. Not so fast my friends. 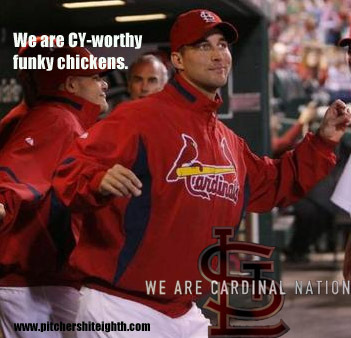 The members of Cardinal Nation also devote a lot of time to other things….like dancing for no apparent reason. Just ask Waino. We are about baby giraffes tumbling…. Also, check with Joe Kelly as well. 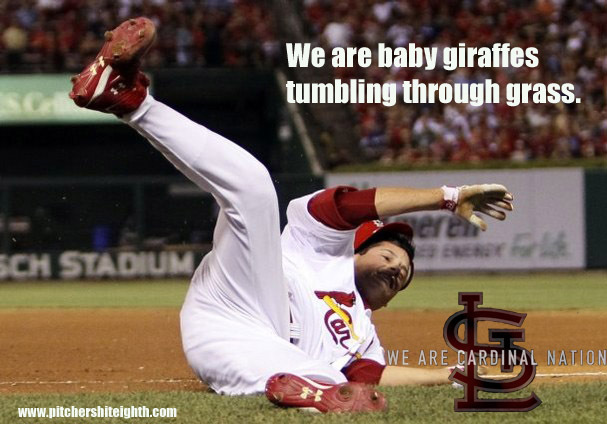 Cardinal Nation is all about baby giraffes tumbling in the grass. To be fair to Joe, speed don’t slump, and he tumbled only after reaching 1st base safely. We are infield hits and pitchers going 100% down the line to 1st base. We may or may not be Cardinal Nation. We are also highly in favor of well-groomed beards and players in the powder blue throwback uniforms. 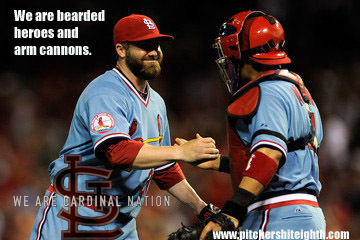 It helps that the guys wearing them are Jason Motte and Yadier Molina. Motte has a 2.68 ERA, 29 saves, a .932 WHIP, and 10.4 strikeouts per 9 innings. Molina has an arm cannon and happens to be the only NL player in possession of a Platinum Glove Award. Yes, we’re all about high heat and a 46% success rate at throwing out potential thieves on the bases. We kinda sorta want to be Cardinal Nation….or something. Top 10 defensive CF in baseball? Check. A .300+ career hitter? Check. 3.0 WAR in 80 games played this season? Check. Jon Jay may deserve to be a Gold Glove finalist, but some might question whether or not he’s hit well enough to earn it. Take that .393 OBP out for a test drive, and then you tell me what U think. 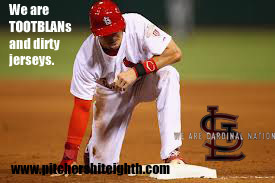 We can haz Cardinal Nation membership? 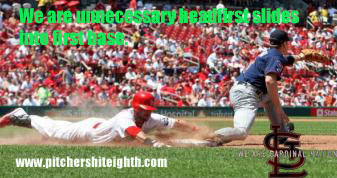 We are definitely all about the headfirst slide into first, despite what physics tells us about running through the bag. Homercles cares not for beans (Simpson’s reference), and Skip Schumaker cares not for a clean uniform. We are most certainly contemplating the invitation to join Cardinal Nation. Thrown Out On The Basepaths Like A Nincompoop. Everybody has done it. Nobody does it quite like the Cardinals, and that just endears the team even more to the fans. 100% physical effort. 0% common sense. That’s the recipe for TOOTBLAN. We is Cardinal Nations. Of course this is all in fun. 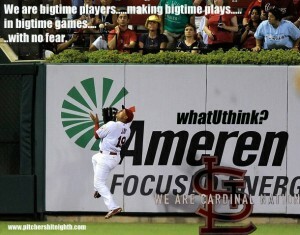 It wouldn’t be so much fun if not for the players who make it enjoyable to watch the Cardinals play. Success begets success….and good attendance. That’s one reason why it’s so much fun to root for the ring bearers. We really are Cardinal Nation. TIDBIT: Today the members of the UCB (United Cardinal Bloggers) are doing a project called “Cardinal Fan Probs” which is basically a converted meme wrapped in a burrito and buried inside an enema….or something like that. Regardless, follow the hashtag #CardinalFanProbs on Twitter for what I expect to be some rather amusing insight into the minds of our many basement dwellers. Also, feel free to join in the fun and tweet about your favorite Cardinal fan problems. Follow gr33nazn on Twitter for more about being “#CardinalFanProbs”! Speaking of Waino, I wonder if/when the Cardinals go post-season and do well, if we’ll look back on his complete game against Houston as the turning point. This coming after the 19 inning nightmare, him doing so well after starting so slow and coming off Tommy John surgery…it just has that symbolic feel of perseverance. If I’m correct, I get a Wainwright game-worn jersey, right? If you are correct, I would be happy to find a game work Waino jersey just for the heck of it and send it to you. I think a little credit has to go to Matheny for having the guys ready to go behind Waino. I’ve questioned Matheny’s work on the field, but I think he’s been a solid clubhouse guy. I also think it’s worth remembering that the team was greatly encouraged by the innings pitched by Jaime and Kelly as well. A healthy Jaime is a legit #2 type starter, and gettinh him back was of no little significance. Previous post: How do you control something Wild?